Spring marks a busy season for local dahlia growers. In addition to potting tubers, taking cuttings, and preparing beds, members of regional dahlia societies are excitedly gearing up for the 50th National Dahlia Show in Asheville this September. It’s the first time in 23 years that the show has been held in WNC. The hosts, which in addition to the Carolinas Dahlia Society (CDS) include dahlia groups from Georgia, Tennessee, and Alabama, are going all out in preparation. Five years of planning will culminate in a magnificent exhibition weekend to include garden tours in four WNC counties, says CDS President Buddy Dean. To raise funds for the show—and to share their favorite plants—society members sell top-quality, locally grown tubers; several of the varieties were hybridized right here in WNC. The tubers were dug last fall and carefully sorted, packaged, labeled, and stored over winter. Some 200 show-quality varieties will be available for purchase at plant sales across the region this spring. (Visit wncmagazine.com for details.) That’s just in time for gardeners to plant them for a breathtaking, nonstop flower show lasting from mid-August until frost. Read on as three local dahlia experts share their passion for these voluptuous bloomers as well as some helpful growing tips. Now a member of the Carolinas Dahlia Society, Killingsworth has been growing since 1970, and for about 12 years owned and operated Creekside Dahlia Farm in Ellijay, Georgia, where he sold tubers and cut flowers and even developed several new varieties, all bearing Creekside in their name. Today he is the senior dahlia grower at Bullington Gardens in Hendersonville, where he has volunteered for the past three years. This 12-acre public garden, home to about 500 dahlia plants, is an exemplary venue for viewing an enormous variety of impeccable blooms. “I start the tubers as early as February, waking them up. It’s a very slow process,” he explains. To maximize the number of new plants, he takes cuttings of the young shoots that sprout from the tubers when they are four to five inches long and roots them in wet Oasis flower foam. “Within a month you can pot them, so you can grow a lot,” he says. He recommends that home gardeners pot their tubers in a lightweight growing mix before planting. “And don’t water the tuber until green sprouts appear,” he says. Killingsworth says that WNC’s altitude, with the resulting heavy morning dews, is conducive for growing dahlias. “It’s like giving them a little shower every morning. It helps keep them cool,” he explains. He also advises using mulch around the plants to keep the soil cool and evenly moist. • Don’t plant dahlias outside until the soil is 70°F. • Don’t water until green shoots appear; the tuber contains sufficient food and water to initiate growth. • If you’re just growing a few, tomato cages work well for support. • As plants get tall, remove bottom leaves to improve air circulation. • Water deeply, about an inch per week. To me, there’s not a bad looking dahlia,” says Buddy Dean, who started growing them in the late ’90s, when his grandmother gave him 14 tubers. Four years later, he was growing 1,600 dahlias and had started a small commercial distributorship. 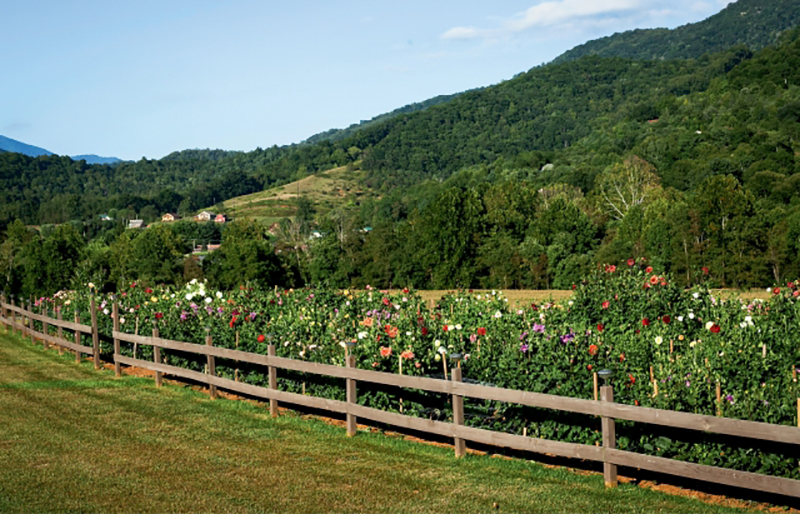 Dean’s Hilltop Dahlias in Cashiers is also an exhibition garden that is open to the public. Dean ships tubers and plants nationwide, and sells the cut flowers locally. He has also developed some 35 to 40 new varieties, all of which bear the name Hilltop. According to Dean, growing dahlias is not complicated. “It’s a plant that wants to grow,” he says. All that’s necessary is to “cover up the root, put a stake in the ground, and tie it to that stake.” Although he admits that show growers often spend a lot of time nurturing their prize plants. “The more you put into them, the better your blooms are going to be,” he says. Most avid growers dig their tubers each fall, but Dean says that if gardeners leave them in the ground and cover them with mulch, most years, 75 to 85 percent will come back. As president and national show chairman of the Carolinas Dahlia Society, Dean suggests new growers take advantage of the plethora of information offered by their local dahlia society. “We have a CDS program called Dahlias 101. If we have a new grower come in, we assign them a mentor.” Rather than overwhelm newcomers with too much information at once, they’re given a to-do list each month. “We don’t say this is what you need to do for the whole season, but this is what you need to do for the next 30 days,” Dean says. And if you run into problems, you can pick up the phone and call your mentor. Dean’s dahlia garden is open to the public by appointment only. To visit, call (828) 421-9458 or see www.hilltopdahlias.com to order online. Learn more about the CDS at www.carolinasdahliasociety.org. • It’s better to plant individual tubers rather than large clumps. • Every two to three years, divide clumps. • Stake to keep plant upright; once it flops over it won’t straighten back up. • Join your local dahlia society. While working as a motor fuel chemist for the North Carolina Department of Agriculture, Jack Leatherwood of Maggie Valley never had time to fiddle with flowers. After he retired though, some beautiful blooms in a catalog caught his eye, so he decided to buy three, even though he didn’t know anything about them. Today he has 1,100 spectacular dahlias in a rainbow of colors, planted in neatly tended, irrigated rows. Leatherwood doesn’t have a greenhouse, so he plants his 1,100 tubers directly in the field where he has no control over temperatures; this can pose a challenge in getting them to sprout. “They seem to want to take their sweet time,” he says. For the home gardener growing just a few, Leatherwood suggests starting them in pots in a sunny heated room before planting them in the garden. “You can trick them,” he says. Leatherwood and his wife, Sandy, grow their dahlias exclusively to sell as cut flowers. “We cut and run,” laughs Leatherwood. “Cut them and run as fast as we can to the florist.” They sell to many flower shops in Haywood, Buncombe, and Henderson counties. Flowers for the market are cut on Friday night, an activity that often involves a number of friends. “We turn on music and drink wine and cut flowers. Then after that, we cook hamburgers,” says Leatherwood, who knows how to mix business with pleasure. Leatherwood became involved in the Carolinas Dahlia Society about eight years ago. “I joined the dahlia society and that’s when I started learning. You learn so much.” He recommends joining CDS to anyone who is interested in dahlias. • Start with at least four or five plants. Don’t start with just one. You always have the possibility of loosing one. • Put the stake in the ground before you plant so you don’t risk driving the stake through the root. • Plant in mid May. Dahlias start blooming about eight weeks after planting. • The best time to cut is early morning or evening. Don’t cut in the middle part of the day when stems contain less moisture. • Change the water for cut flowers every day or two so they last longer.